Southington Hotel Offers Incredible Location The gently rolling hills of Southington are nestled in the valley of two mountains, boasting a landscape of gently rolling hills dotted with orchards. Begin your journey at the Holiday Inn Express Southington and explore all that central Connecticut has to offer. Our convenient location off I-84 only 20 minutes from Hartford and 30 minutes from Bradley International Airport makes travel very convenient. You'll have access to many dining, entertainment and cultural options. 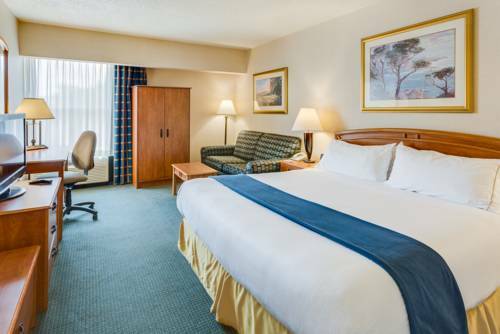 Only minutes from ESPN headquarters, General Electric, Trumpf, and Yarde Metals, this hotel is ideal for business trips. With 3 different meeting rooms totaling 3,700 sq. ft., we have the perfect space for your next meeting. You can put the finishing touches on a presentation in the business center or get a work out in our newly renovated fitness center. All our rooms have free high-speed wireless internet access. From Lake Compounce Family Theme Park to Mount Southington ski area, there's year-round entertainment. Our hotel is minutes from Westfarms Mall, where you can shop Nordstrom and Macys for the holidays. The Holiday Inn Express provides guests with friendly service. Pick-up your favorite snack at the 24-hour market. Each morning, you can fuel up at the complimentary full hot breakfast, which has both hot and cold items. Whether travel for business or leisure, Holiday Inn Express Southington is your home away from home. Make your reservation today! Hawks Landing is a excellent course located less than 5 minutes away. New England's Family Theme Park! Hours are seasonal please check Lake Compounce website to verify hours of operation. Hotel offers packages with Lake Compounce tickets! We specialize in Exquisite Vintage Jewelry, Hand Carved Cameos and Shells, Vera Bradley and Vintage Handbags, Handmade Linens and Fine Collectables. Most of the items are Handcrafted in the USA, Italy, Germany, France, England, and Austria. Tribute to the famous showman features a Merman made for a TV production; the walnut-shaped carriage of 29-inch-tall Commodore Nutt; and a mounted skeleton of a half-man, half-horse. Currently housed in a former bank during museum repairs. Where they buried the diminutive circus performer, and his big promoter.